Following a low-profile launch by Three in December 2013, all four of the UK mobile network operators now offer 4G LTE services to at least some of their subscribers. While early impressions of LTE data services are favourable, I have heard mixed reviews about the quality of voice calls for LTE subscribers in the UK, including an LTE user in central London who has permanently switched off LTE in his phone, because his voice services were unusable. I don’t yet have enough evidence to draw firm conclusions on this, but it comes as no surprise that the somewhat contrived voice solutions of LTE can lead to problems. I will be watching this closely as LTE take-up increases, but in the meantime I thought it would be a good time to take another look at where we are up to with voice services in LTE. Call setup times are extended, because of the need to switch radio networks as well as establishing a circuit switched call. 2G and 3G radio technologies use spectrum less efficiently than LTE, so it is wasteful of capacity to use GSM or WCDMA when LTE coverage is available. It is quite possible that a handset operating with a strong LTE signal, for example indoors at 800MHz, might fall back to a weak 3G signal at 2.1GHz. This could result in a poor quality voice call even if the handset was showing a perfectly good LTE signal immediately prior to making the call. A quirk of deploying LTE in one of its lower frequency bands is that it can improve the indoor coverage of mobile data services, which are often already well catered for by WiFi, but not voice services. In fact a Skype call over LTE might achieve better quality than a 3G voice call. Having said all of this, CSFB implementations are being refined all the time, with steps taken to reduce call setup delay and improve reliability. The challenge for network operators is to decide how much time and effort to invest into CSFB and how long to wait before introducing true LTE voice services. Network operators can avoid the disadvantages of CSFB by delivering voice calls over their LTE infrastructure using Voice over LTE (VoLTE) technology. VoLTE has a number of benefits over CSFB, including faster call connection (less than half a second), greater spectral efficiency, high definition (HD) wideband voice quality and the potential for Rich Communication Services (RCS), which combine voice with presence information, location awareness, instant messaging, video calling and media sharing. VoLTE services have other features that can help mobile network operators to differentiate them from “over the top” voice over IP services, such as Skype, Google Talk and Facetime. The quality of over the top services can be affected by IP traffic loads in both networks and devices, whereas VoLTE is protected by prioritisation. VoLTE also benefits from global interoperability of services and being part of the standard telephone numbering system. Unfortunately there are a number of challenges to overcome before VoLTE is widely implemented. VoLTE requires network operators to invest in an IP Multimedia Subsystem (IMS) supporting Mobile Multimedia Telephony and to undertake upgrades to the LTE radio access network and core network. Also, VoLTE on its own may not be enough. Unless an operator is able to provide blanket coverage of LTE from day one, there is a need to deal with the situation where a subscriber moves out of LTE coverage during a VoLTE call. During the deployment of 3G networks, UMTS supported the handover of voice calls between 3G WCDMA and 2G GSM from the outset, which allowed network operators to build their 3G coverage gradually, in the knowledge that voice calls would be maintained as users moved in and out of 3G areas. Handover between WCDMA and GSM was eased by the fact that they shared essentially the same core network and followed the same approach to carrying voice calls. In contrast, compared with its predecessors, VoLTE uses a fundamentally different method of transporting speech, based on IP packet switching rather than circuit switching. This makes it much more difficult to achieve seamless transfers of calls between VoLTE and legacy systems. Early examples of VoLTE services, such as those launched in South Korea and the USA in August 2012, simply ignored this problem. If a user moved outside LTE coverage during a VoLTE call, the call would drop. This was no major concern for the South Korean network operators, because they deployed almost universal coverage of LTE. However, it would be a significant problem in many other countries, where there are likely to be less aggressive coverage roll-out plans. The solution for achieving handover from VoLTE to legacy voice services is known as Single Radio Voice Call Continuity (SRVCC). Whereas CSFB switches a handset from LTE to 2G/3G prior to, or during, the setup of a voice call, SRVCC involves the transfer of a live call. This places significant demands on the network in order to achieve reliability, minimal voice interruption and consistent call quality. SRVCC was first specified in 3GPP Release 8, but there have been enhancements in each subsequent release of the standard and the GSM Association recommends the adoption of at least the Release 10 architecture to achieve satisfactory performance. 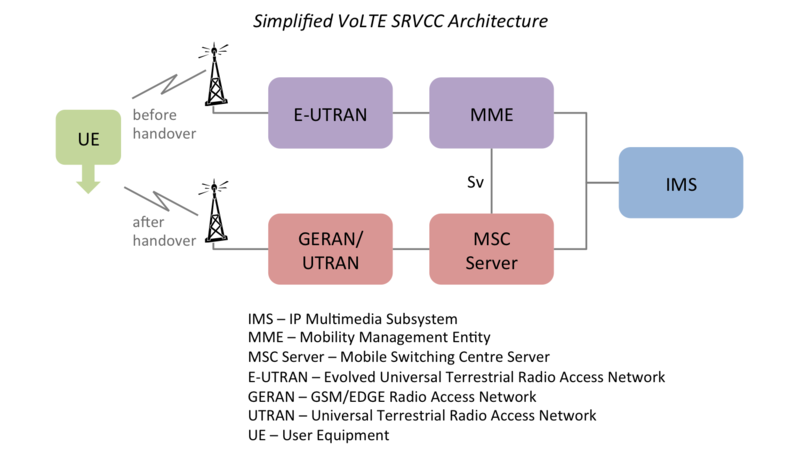 Based on measurements provided by the UE, the E-UTRAN determines that SRVCC handover is required and sends a handover request to the MME, identifying a target cell in the 2G/3G network. The MME then triggers the SRVCC procedure in the MSC server by sending a handover request over the Sv interface. The MSC coordinates the handover of the UE to the legacy network with the transfer of the voice call session from packet switching to circuit switching in the IMS. The MSC creates the necessary circuit switched bearers and then sends a handover response message to the MME, containing the handover command message required for the UE to access the 2G/3G network. Throughout the process, overall control of the telephony session is maintained by the IMS. If the 2G/3G network and handset are able to carry packet switched data simultaneously with circuit switched voice, a user’s data sessions can be handed over at the same time as the voice call. The data sessions may be handed back to LTE when the mobile moves back into LTE coverage and concludes its voice call. In February 2013, O2 Germany reported the first example of handover of a live call between VoLTE and 2G/3G in a multivendor test network. 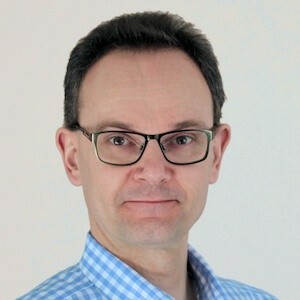 O2 went on to begin the roll out of VoLTE in its live network in November 2013 and hoped to start introducing SRVCC handover before the end of the year. Some of the milestones in the introduction of LTE voice services are summarised in the following table. December 2010 Verizon launches LTE and introduces dual-radio handsets, which support voice on circuit switched CDMA and data on packet switched LTE. Bulky handsets. Heavy power consumption takes its toll on battery life. November 2011 AT&T launches single-radio handsets, which support voice using CSFB. Long call setup times. Differing coverage between LTE and legacy network. 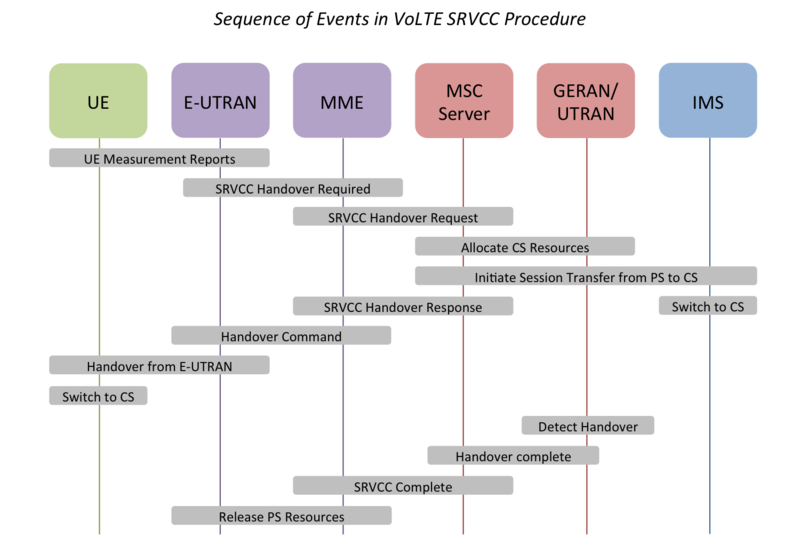 February 2012 Qualcomm and Ericsson report successful tests of SRVCC handover from VoLTE to WCDMA. Solution limited to Qualcomm and Ericsson. August 2012 South Korean and US operators launch VoLTE without SRVCC. Call drops if users move outside LTE coverage during a VoLTE call. February 2013 O2 Germany reports successful multivendor tests of SRVCC handover from VoLTE to GSM and WCDMA. First multivendor tests. December 2013 O2 Germany introduces SRVCC into live LTE network. First SRVCC in a live network. Ideally, most network operators would like to move to VoLTE as soon as possible, to fend off competition from over the top services such as Skype, which had almost 300 million users by mid-2013. However, it is essential that the quality and capability of VoLTE services is clearly superior to cheap (or free) alternatives. HD voice and RCS may be attractive in principle, but if the reliability and quality of the underlying VoLTE service is inadequate it could be a disaster for mobile operators. For most network operators, the natural evolution will be to introduce LTE with CSFB and to take advantage of improvements in the performance of CSFB as they come along, while preparing for the introduction of VoLTE. Some network operators may launch VoLTE when they feel they have sufficient LTE coverage to provide an acceptable service in its own right. Others may choose to launch when they have confidence that VoLTE with SRVCC is able to meet quality expectations. Either way, we will have to wait a little while longer before VoLTE is widely used.